STOCKHOLM Furniture Fair 2011 // Happy 60th! A small and cramped North London apartment is converted into a roomy modern space by Alex Haw of Atmos Studio. 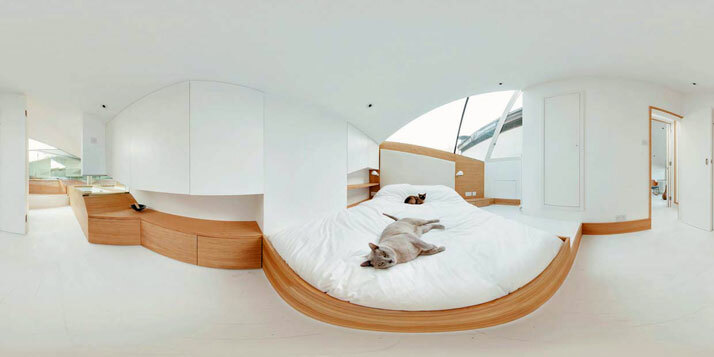 The alluring organic asymmetrical forms used in the interior are not the first of their kind, but they surely are captivating and seducing to the human eye. The home of musician Jamie Norton - who has worked with Take That, McFly and Incognito - has been converted to an apartment that wraps built-in furniture into every beneficial surface due to its limited space. 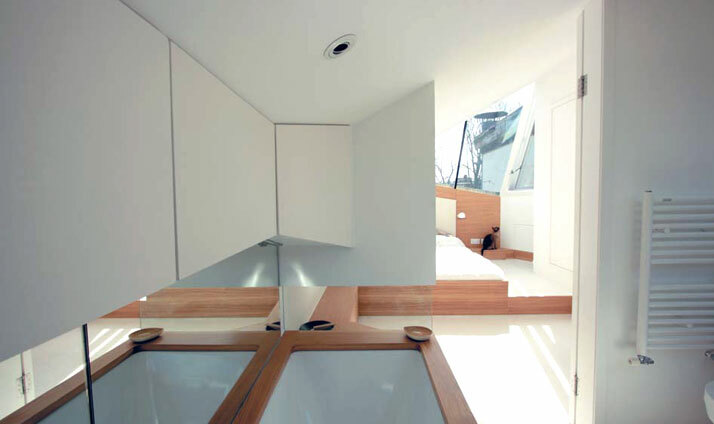 The renovation of the apartment interior is perhaps one of the smallest projects that Haw has dealt with; however the interior and architectural design scheme was "one of the most boldly conceived and executed," claims Haw; who achieved to get the most out of the apartment's space by doing the less there was to it. 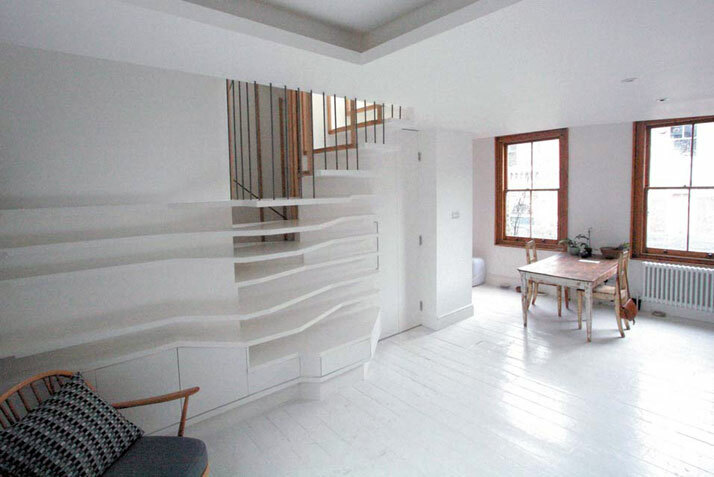 The double storey apartment is located on the last floors of a Baroque Grade-II building in a conservation area; crunched between like buildings. Both plan and planning constraints produced a complex series of intertwining spaces, enlivened by light and interconnectivity. 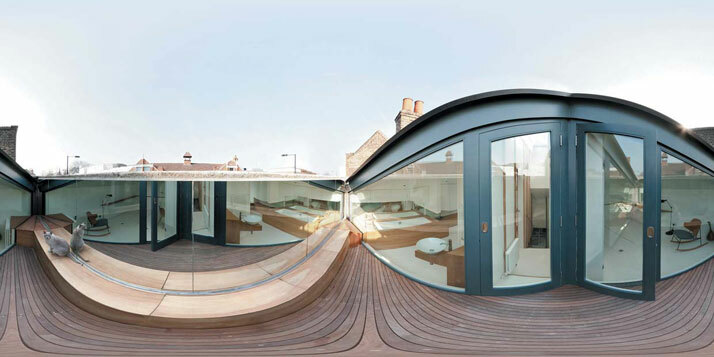 The solution was generated from the view-lines along the street below, and folded protectively out of sight to achieve planning permission for the addition of a new storey with front outdoor space hidden within the row of listed buildings. The double-pitched butterfly roof, with eleven facets, five of which are glazed angle upwards from the lateral part of the walls at the center of the staircase to flood the void beneath with natural light. On the other hand, the courtyard created offers privacy yet also generous views of sky and city and tantalizing views into the intricacy of this urban jewel. 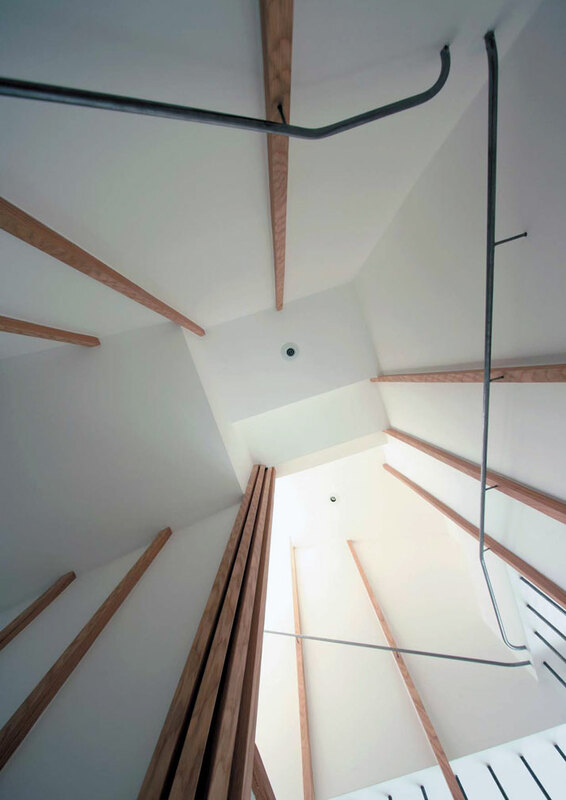 Alex Haw has made the most of utilizing this natural light which floods from the central staircase, and has assembled the architectural design of the house around the open stair. 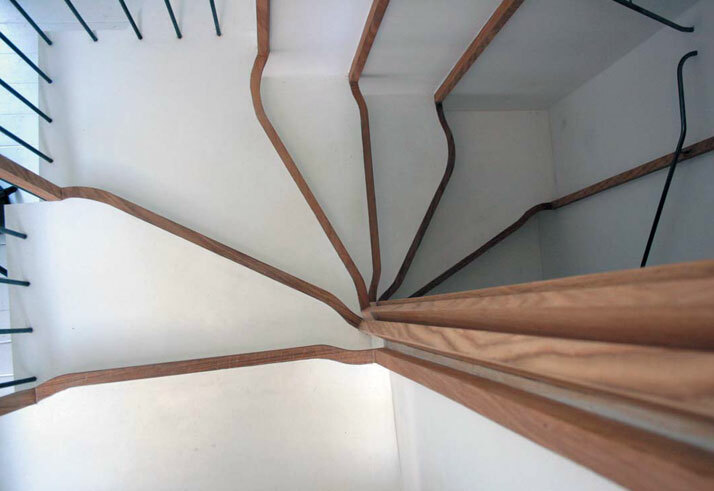 The staircase has been designed in such a manner that timber strands grow upwards towards the light, releasing dainty strands to frame each step, a single thin metallic line eloquently moves across the lines to offer the lightest of additional support to the hands that seek it. 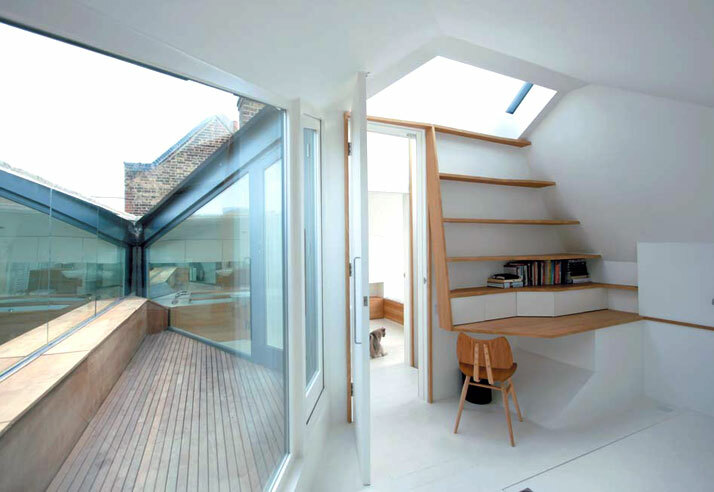 Spaces have been transformed in, around and about the stairs, as bathroom storage below or the underside of the desk above, whereas to the right steps support and spread out into various surfaces for the living room. 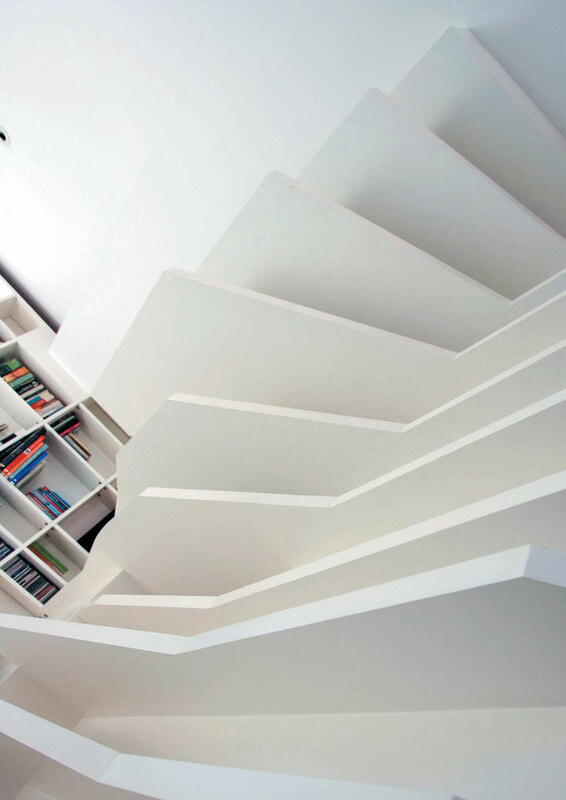 Furthermore, the lower steps in the living room area support a seat and a soft-spot, while the upper elements of the stairs flow around the living room with a sea of books and shelves. The stairs, the shelves, and the living room floor and ceiling have all followed an all white interior design scheme, apart from the brick fireplace which adds a contrasting element to this all white minimal design scheme. Shabby chic vintage furniture compliments the overall white background as it sets a dramatic tone to the minimal interior. 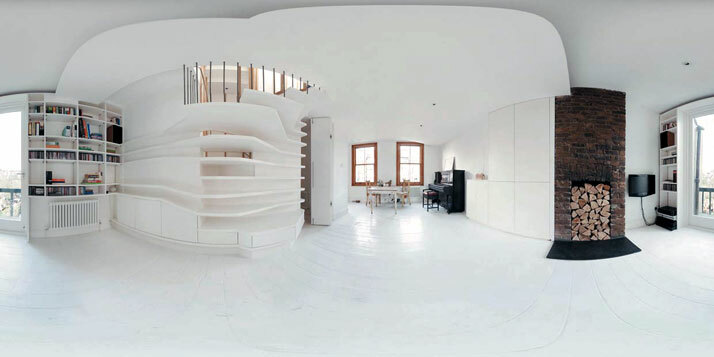 On the upper floor, the staircase continues with its stunning, playful and simple design to create lines that flow to form a desk and a shelving unit, as it covers within the blossomed out white floorplanks that conceal a bed within. At the bedroom the custom made furniture unveils itself to form a low table, flow our to a long courtyard storage bench, which slips back in as a bathroom counter, carved with a sunken bath. 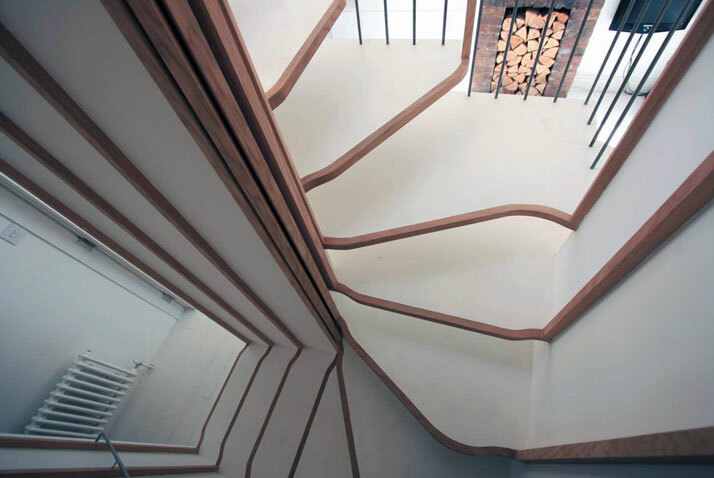 The same surface unfolds itself in an organic manner to create all these forms; it seems as if the entire house is unified through this undulating piece. 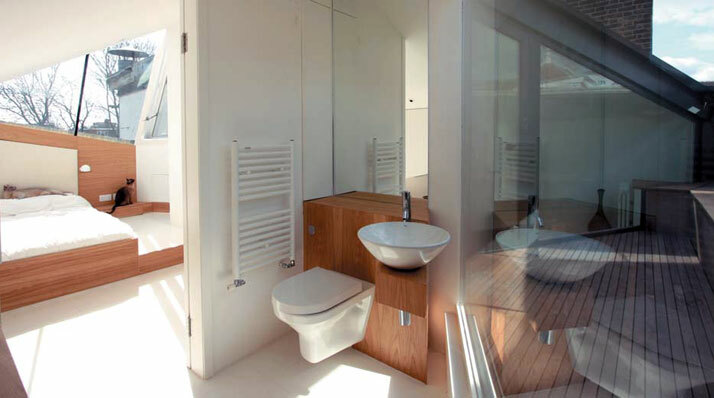 According to Alex Haw, the overall interior architectural design scheme projects the client's interest in Japanese economy restraint and invention, and provides a sense of surprising spaciousness within tight confines. Spaces from adjacent rooms are borrowed and traded, with each room offering a panoply of different views and directions. 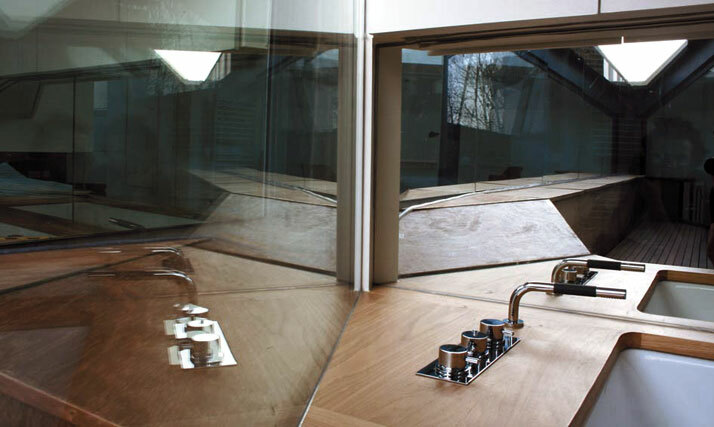 Mirrors double and quadruple the extent of views and entice optical exploration, while maximum continuity between the surfaces of the built-in furniture provides a sense of further elongation, and interest. 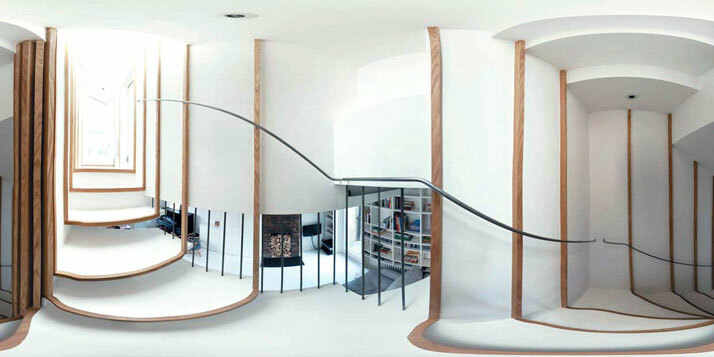 Moreover, the apartment has been tailored to meet the specific personality and interests of the clients; such an example that reflects the musical interest of the client in my opinion is the central staircase with its timber border which can optically be compared with the treble clef. 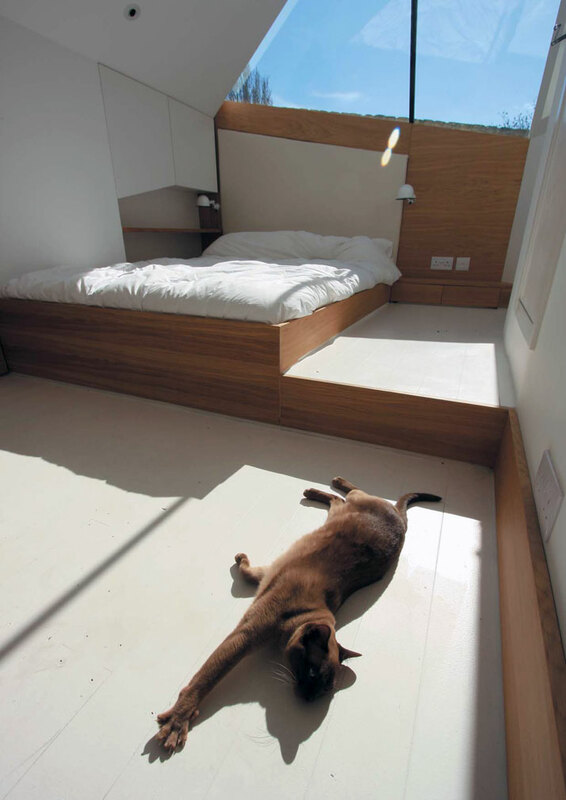 Overall the furniture unfolds itself within this house as a piece of partitur to create a synthesis of furniture.